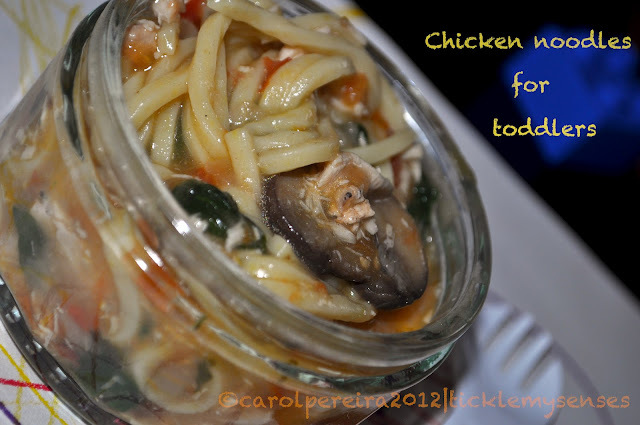 Tickle My Senses: Chicken Noodles with Mushrooms and Spinach for little monkeys!! 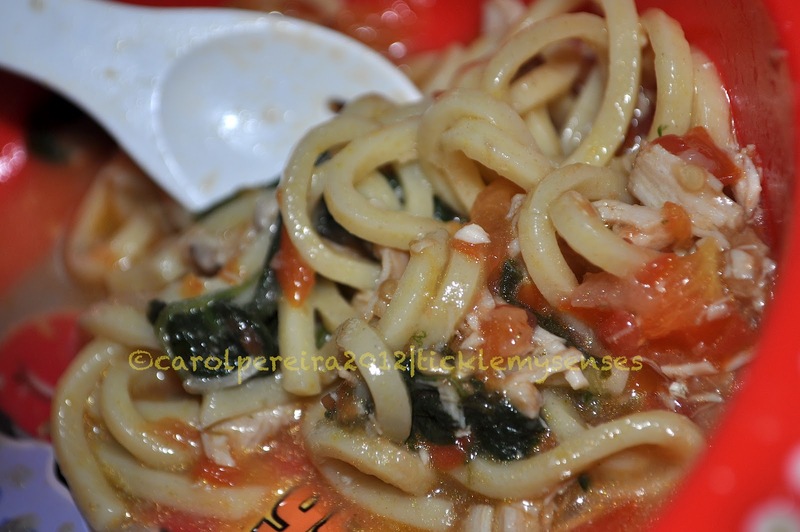 Chicken Noodles with Mushrooms and Spinach for little monkeys!! 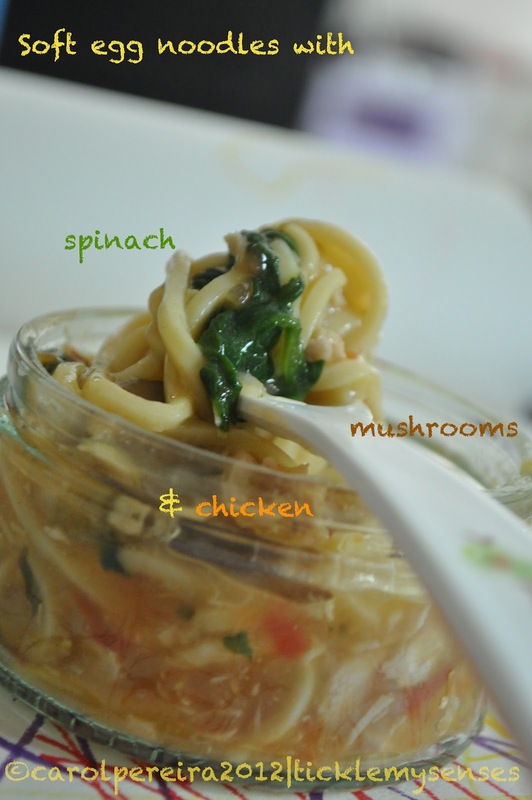 Most children love noodles and this is Baby A's favourite chicken noodles recipe. This delicious noodles preparation is packed with the goodness of vegetables and chicken, and is a super easy way to get your lil ones to enjoy a balanced meal. Its a joy to watch Baby A having fun slurping up these soft egg noodles with chicken, mushrooms and spinach. Even though he has learned to eat with a fork, when it comes to noodles it is his fingers he prefers. The not-so fun part for mommy begins when he comes chasing with those sticky fingers ;) Make sure you've got some wet wipes handy or else you're in big trouble!! To make Chicken Noodles with Mushrooms and Spinach. 1. Heat oil in a non stick pan add cinnamon stick fry for a few seconds, then remove, add minced onions to the same oil and fry till golden brown, add the minced tomatoes fry for a minute, add cooked shredded chicken, thinly sliced mushrooms, baby spinach and cooked egg noodles. Add 1/2 cup of water, 1/8th of chicken stock cube (or if you have ready stock use instead of water and skip the stock cube). Close the pan and allow all the ingredients to infuse its flavours for around 4-5 minutes. 2. When the mushrooms have cooked and there is still around 2 tbsps stock remaining in the pan, taste for salt, add the cornflour mixture. Allow the stock to slightly thicken and coat the noodles. Turn off the heat, add a squeeze of lemon juice, mix well. Serve warm in a bowl with a child safe fork. My 2 year old son loves to eat chicken noodles. We stir fry wheat noodles with veggies and chicken and he loves it. This way we can manage to make him eat veggies. Thanks Sadaf for visiting and leaving your comment :)) I hope you try this recipe and like it! !